Wisdom teeth are alternatively called Third Molars. Most people have 4 wisdom teeth, 2 in the upper jaw and 2 in the lower jaw. Some people do not develop all their wisdom teeth and can be missing one or more wisdom teeth Wisdom teeth generally erupt into the mouth from about 18 years to 25 years old. The reasons to remove wisdom teeth are considered on a case by case basis as it is not always necessary to remove wisdom teeth. In many people there is not enough space at the rear of the jaws for wisdom teeth to fully erupt and be functional. When there is not enough space for the wisdom tooth to come through, the tooth becomes wedged or “impacted”. Impactions can involve just soft tissue (gum), or hard tissue (bone). Some fully buried wisdom teeth remain in place and cause no obvious trouble; however, many will eventually cause problems. We may professionally recommend wisdom teeth removal if there is insufficient room for the tooth/teeth to erupt, you are in need of orthodontic treatment or if you are experiencing symptoms associated with the eruption/impaction of your wisdom teeth. 6. To reduce potential crowding and assist orthodontic treatment by lessening the effects of pushing and crowding on remaining teeth as the wisdom teeth try to move forward or erupt. Wisdom teeth that are left for a “wait and see approach” can be harder to remove at a later date and can result in a slower and more painful healing phase. There is also a greater chance of complications from the surgery required to remove them as the teeth are more likely to encroach on surrounding nerves as their roots develop fully. 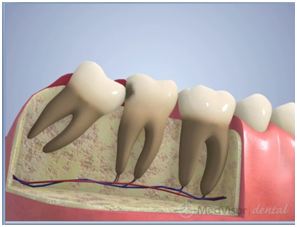 What is the procedure for wisdom teeth removal? Wisdom teeth can be removed under local anaesthetic in the Dentist’s chair, under intravenous sedation in the dentist’s chair or under general anaesthetic in a hospital. Procedures under local anaesthetic usually takes place in our Burwood East clinic, and can be performed with or without oral sedatives, nitrous oxide sedation or intravenous sedation. Local anaestheticwill remove any pain sensation. The alternative option is wisdom teeth removal under general anaesthetic in a private hospital setting. Many people opt for a general anaesthetic so that they can sleep through the procedure and be totally unaware of any part of the experience. In order for us to make a recommendation on whether you or your child should undergo wisdom teeth removal, a full mouth x-ray (OPG) will be required to assess the position, level of development and likelihood of normal eruption. You will then be able to provide you with appropriate treatment options along with an estimate of associated costs.